After shopping for a vanity for awhile and not finding what I wanted (within my budget), I decided to make my own. I love thrifting and I love Do-It-Yourself projects! So why not, right?! Before this, I hadn't upgraded my thrift shopping to furniture, however, I'd seen enough golden finds to want to try it out myself. I set out on a mission to find a table (with or without drawers) or a desk, and a large mirror. Thrift shopping takes patience for a number of reasons - you never know what the store is actually going to have and you're probably going to have to dig before you find the good stuff - so I didn't expect to find it immediately. But I finally scored a quality Bassett desk for, wait for it... $20!! Please follow the link if you've never heard of Bassett or their $1K-$2K prices for this kind of furniture (yes, desks!) so you can truly understand how great of a deal this was! Needless to say, I was super excited. And when I went back to pick it up, I found a large mirror to go with it for *drumroll please* $5!! Woot woot!! Commence project planning! I didn't like the wood color on either one so I decided to refinish them both. The wonderful thing about getting quality wood furniture is that, with a little elbow grease, you can redesign them this way. And when you watch HGTV as much as I do, you feel like you can do anything lol! I went to Lowe's for my supplies: sandpaper, wood & satin finish, sponges, paint brushes, cheese cloth... fun stuff! I borrowed my aunt's hand sander and got started. Sounds simple right? Well it is and it isn't. In that properly sanding wood is no joke! I felt like my arms were gonna fall off! My dad laughed at me cuz he thought I underestimated how much work it would take to get the old finish removed. Yea... he was right, but don't tell him I admitted that. Thanks HGTV. The pic above is when I first started sanding and realized I needed to step my weight up. It took a little while for me to get the hang of it. That was really where the most work was required in this project, which I didn't mind at all. Once I was done with the desk, the mirror was easy peasy. I really enjoy creating and figuring out how to do things. I think it's kinda therapeutic for me, and when I'm done I get so excited when it turns out well. I love it! One of the best parts is I spent a little over $50 for the desk, mirror, and supplies. That cannot be beat. And if I get tired of the wood grain look, I can just paint over it. The drawers are so deep, it holds my ridiculous product stash, hair accessories, tools, and makeup quite well. Pretty much exactly what I wanted! Melanie I love this! 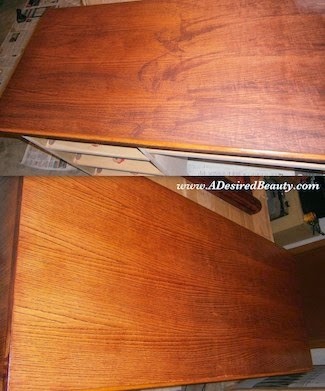 I've been thinking of getting a vanity recently especially since acquiring so many hair products. It will definitely be nice to sit at while detangling and styling hair! Great job on your first remodeling project! Thank you, Jas! Those were the main reasons I wanted one, too. It's so functional idk how I went without one for so long. A job well done. I love the color. Mine is built in, thank God! I would have never tried something like this. Great post. Thanks so much Nerline! A built in vanity sounds very nice. Well done Melanie you are one handy lady! I love thrifting my shopping rule is if i like it, I can afford it, it's in good condition, it fits me for clothes and shoes then I am buying it it doesn't matter if it comes from a department store, straight from a designer or a flea market. I so agree, Lydz! I am an equal opportunity shopper and I love when I find brand new items (tags still attached) for a few dollars. Thank you!! Impressive! Cannot wait for the next idea. Given a free hand, no telling what you will create! The law of diminishing returns is at work here – new technology equates to startling new creations – old technology equates to few new creations. Looks great. I love the color. I like this DIY project very much. I'm doing some research on DIY projects. I want to do something like that for my family. Thanks for sharing your experiences. Amazing girl! I am very admiration you. Wow! This is also nice DIY project. I like it. Thank you! I am waiting your next posts. Let's share with me. Nice job and terrific save on the oops spot. Don’t ever feel guilty for painting wood! It is your wood and you can do with it as you wish! Wow, absolutely love what you did there! I agree that furniture shopping can be a frustrating experience especially when you can't find anything you like within your budget. Very nice work. But it's very difficult for those who don't know about woodworking. And I'm waiting for your next awesome work.